33 year old Leanne Bearden has been missing since January 17, 2014 when she was last seen going for a walk on Friday afternoon around 1:00 pm in the Garden Ridge, TX area. Several searches have taken place for the missing woman to no avail. Today, Garden Ridge police Chief Donna O’Conner said a body found in the backyard of a Garden Ridge home this afternoon is believed to be that of missing Leanne Bearden. According to reports, the death appears to be an apparent suicide. Bearden’s body was found a few blocks from where she was last seen walking on Jan. 17 by a man working in the area. Seriously? Leanne Bearden has been missing for about a month, numerous searches were made, including a 23 sq. 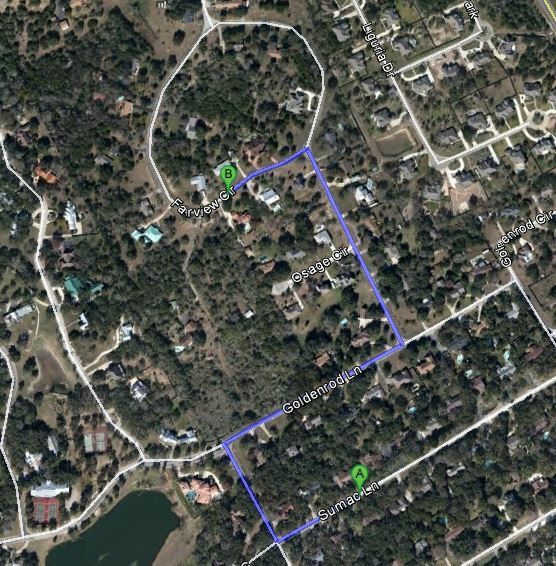 mile targeted area, yet a two block radius around the home that Bearden left to go on her walk on January 17th was not searched with a fine tooth comb, really? Law enforcement and the family believed from the outset that there was no foul play, Leanne might have left on her own, or she might have injured herself or gotten lost while on her hike. Neighbors and property owners were asked to be on the look out for the missing woman and to check their property and out-buildings. With all that, Leanne Bearden was sadly found today deceased what is stated to be an apparent suicide. I must admit having been a part of many missing person searches, I am a bit amazed and some what suspicious that this area was not previously and better searched. The home where her body was found is located in the 21000 block of Fairview Circle, about two blocks from where she was last seen. A source in Comal County confirmed to KSAT’s Steve Spriester late Thursday afternoon that her death was an apparent suicide. Dispatch received a call at 12:18 p.m. on Thursday from a man who told them he spotted a body in a wooded area behind his house, O’Conner said. The homeowner said he discovered Bearden’s body around noon on Thursday in a brushy area behind his home. 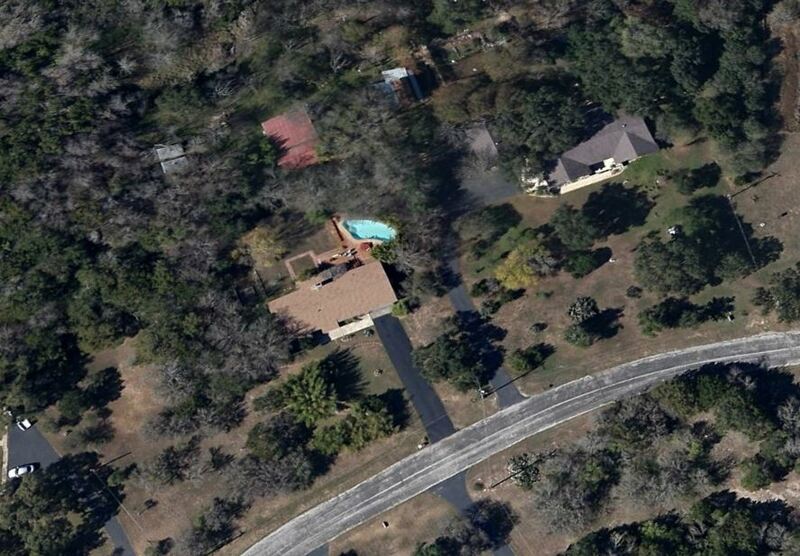 That area is an undeveloped part of his property he does not walk through often, but did on Thursday. Garden Ridge police, Comal County Sheriff’s deputies and Texas Rangers went to the scene and examined the body, which had some identifying jewelry as well as a backpack, O’Conner said. She was apparently found with the same backpack she was carrying when she left her in-laws house. B: 21000 block of Fairview Circle area where Leanne’s body was found. The location where her body was found (B) was about a half mile away from the home she left from (A) or about a 13 minute walk. UPDATE II: Body of missing woman found in wooded Texas area. … Chief of Police Not Speculating on Cause of death. The body of a woman who had been missing for almost a month was found in a wooded area behind a home Thursday in Garden Ridge. Leanne Bearden, 33, went for a walk on Jan. 17 while visiting her in-laws in Garden Ridge, and never came back. Police responded to the scene around noon after receiving a tip from a person who spotted the body. Donna O’Conner, Garden Ridge’s police chief, said both families had been notified after the body was found with ID, jewelry and a backpack, according to WOAI, the NBC affiliate in San Antonio. UPDATE III: Death Of Missing Denver Woman In Texas Ruled Suicide. Police in Texas have released a statement saying a Denver woman who was missing for weeks and was found dead on Thursday killed herself. 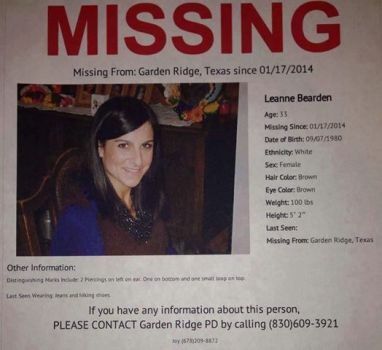 Leanne Bearden went for a walk from her in-laws’ home in Garden Ridge, Texas on Jan. 17. She never returned. Her body was discovered just blocks from where she was last seen. “Bearden’s preliminary cause of death result is asphyxiation by hanging,” according to a release from Garden Ridge, Texas, Police Chief Donna O’Conner. For more updates, provide your own opinions and analysis and read others, go to Scared Monkeys Missing Persons Forum: Leanne Hecht Bearden. 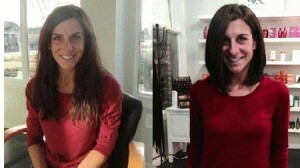 33 year old Leanne Hecht Bearden has been reportedly spotted in Austin, TX. There have been three reported sightings of a woman matching the description of missing Leanne Hecht Bearden. The family has now brought their search 60 miles north of San Antonio to Austin. They are handing out flyers and looking for any answers. Leanne Bearden went for a walk on January 17 while visiting her in-laws in Garden Ridge. She never came back. The family of a missing woman is now checking out claims Leanne Hecht Bearden was spotted in Austin. The private investigator hired by the Bearden family, Charlie Parker, says there have been three reported sightings of a woman matching Bearden’s description. In each case, the woman was panhandling in an area of South Austin. 33 year old Leanne Hecht Bearden has been missing since January 17, 2014 in Garden Ridge, Texas. Leanne’s family says that was last seen when she went to go for a walk on Friday afternoon around 1:00 pm in the Garden Ridge area (map). She said that she would be right back and has never been seen nor heard from again. The Denver, Colorado woman who had traveled the world with her husband was supposed to return home Tuesday; however, instead, she has disappeared in Texas. So how does a woman go missing after going for a walk from her in-laws home, who had just gone on a 56 country excursion with her husband, Josh Bearden, for the past two years? She is 5-foot-2, weighs about 100 pounds and has brown hair and brown eyes. She has two piercings on her left ear: one on the bottom and a small loop at the top. She was last seen wearing jeans and hiking shoes. Friends and family of Leanne Hecht Bearden say that she did not just walk away. According to accounts, Leanne and Josh Bearden were scheduled on Monday to go back to Denver, where they had job interviews lined up. Also according to reports, Leanne Bearden and her husband were the only people in the house around 1 p.m. Friday. Leanne did not take her cellphone or any electronic devices and had $60 in cash at most (VIDEO). She had her wallet with credit cards; however, they have not been used. Leanne and Josh Bearden were scheduled on Monday to go back to Denver, where they had job interviews lined up, Sculley said. They were renting their house there through an agency and were planning to take it over in May, Sculley said. Leanne Bearden was having some difficulties adjusting after the worldwide excursion, according to her sister-in-law. “It was kind of a hard transition for her, so she’s having some anxiety about it, but nothing that seemed like she was just going to run off,” Sculley said. The Beardens blogged during their trip around the world at www.goexplore365.com. They met at a bar, got engaged after eight months of dating and were married at the Denver Zoo, according to the blog. Leanne Bearden has run nine marathons, was in a band before the trip and can do an Elmo impression, the blog says. Leanne Bearden and her husband were the only people in the house around 1 p.m. Friday when she said she was going for a walk, Sculley said. Josh Bearden called police four hours later to report his wife had not returned, Sculley said. Family members said she did not take her cellphone or any electronic devices and had $60 in cash at most. She had her wallet with credit cards but has not used them, according to her husband, who has been checking. Leanne Bearden also had her wedding and engagement rings when she left, family members said. FACEBOOK: Our Friend Leanne Hecht Bearden. UPDATE I: Search for missing Leanne Hecht Bearden turns up no new evidence. Searchers scoured a 23-square-mile area — far larger than tiny, 6-square-mile Garden Ridge. More than 100 volunteers from Texas Search and Rescue and the Texas State Guard Maritime Regiment joined the massive search, as did roughly four dozen law enforcement officials from Comal County, the Department of Public Safety, the Texas Rangers and the FBI, among other agencies. At the conclusion to an “exhaustive search” Saturday for Leanne Hecht Bearden, officials announced they found no evidence a crime had been committed in the area where she was last seen Jan. 17 and would end search efforts. The massive search and rescue effort was launched Saturday morning, as local law enforcement officials enlisted help from agencies across the state to find Bearden, who went for a walk eight days ago and never returned. UPDATE II: Statement from Leanne’s Family. UPDATE III: Map of the area where Leanne Hecht Bearden went missing from. UPDATE IV: Police Say Witness Saw Bearden leave the home January 17, they interviewed that man and verified the time she left the home by herself. There is a quarry nearby as can be seen in the map search above. Maybe divers are needed, if they have not already done so, or side scan sonar. A man trimming trees across the street reportedly saw Bearden leave the home January 17. Garden Ridge police say they interviewed that man and verified the time she left the home by herself, and that everything appeared fine. Many of the Bearden’s friends have put their own lives on hold to help search. There is a quarry nearby, and several wooded areas. UPDATE V: Texas authorities call off search for missing woman, husband vows to keep looking. A person matching the description of 33-year-old Leanne Bearden was seen in the Houston area, according to a Facebook page set up by her friends. On Wednesday, the Houston Chronicle reported that the Houston Police Department had ruled out the woman thought to be Bearden. UPDATE VI: Woman in Houston who matched missing Colorado woman’s description turns out not to be 33 Year Old Leanne Hecht Bearden. UPDATE VII: Family: ‘Strong possibility’ missing woman left on her own. After two weeks of fruitless searching for Leanne Hecht Bearden, her family says evidence suggests “a strong possibility” that she disappeared on her own Jan. 17 from the Garden Ridge home of her in-laws. That conclusion is based on accounts that Bearden, 33, was troubled before leaving the residence and on two reported sightings of her walking along FM 3009 toward Interstate 35 soon afterward. UPDATE VIII: 33 year old Leanne Hecht Bearden found deceased, apparent suicide. For more updates, read others opinions and analysis and to provide your own, go to Scared Monkeys Missing Persons Forum: Leanne Hecht Bearden.